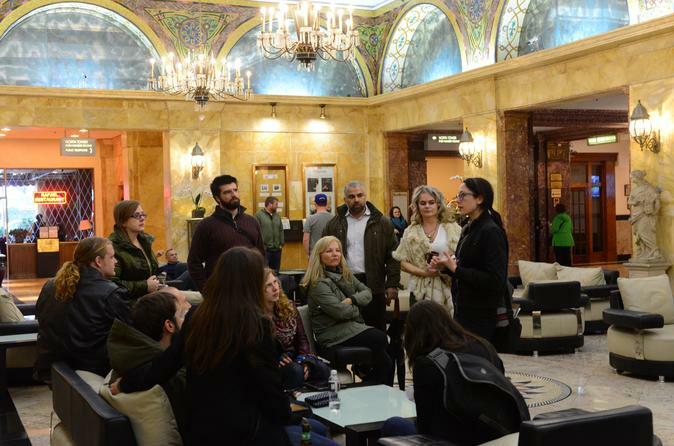 Grab a few drinks while experiencing incredible architecture, historical stories of turn-of-the-century Chicago, and visual scavenger hunts. This very special walking tour digs into how and why the 1893 World’s Fair captures imaginations more than any other event in Chicago history. Unlike other World’s Fair tours and Devil in the White City tours, which likely revolve around facts and trivia, you’ll dig deeper on this downtown tour. You'll visits some of the few remaining and spectacular buildings from the time of the World’s Fair, also known as the World's Columbian Exposition. The fairgrounds themselves were south of downtown, but you can best see the impact of the fair in the Loop. Here the architecture and landscape still show the World’s Fair imprint even today, nearly 125 years later. Beyond just looking at buildings from outside, this mostly indoor walking tour sees the beauty of architectural details within. On this fun and insightful walking tour, you’ll venture into beautiful architectural spaces from the era. You will play a few thoughtfully designed games, like visual scavenger hunts. Along with guide commentary, your guide will show you photos and archival materials via shared iPads that illuminate this historic event of the 1893 World's Fair. You will eat a couple light snacks and play a few educational games with prizes for the winning team. Plus, you can opt to get drinks (on you) at two stops. You will end in a building from 1893 that has numerous drinking options! You can think of this 3-hour long walking tour as being 5% outdoors, 95% indoors, 20% clue-based games and visual scavenger hunts, 10% drinking time, and 100% awesome historical tour time. We know the math doesn’t add up – we hope you get the idea! With just intermittent walks outside, the 1893 World’s Fair Tour makes for a great walking tour in all seasons. This tour makes the World’s Fair’s lasting impact come to life. We hope you’ll join us! Drinks are not included in the cost of this tour. At the tour meeting spot, you are welcome to get a drink at the bar before check-in. To streamline the tour, your order will be taken, along with cash for your second drink at check-in ($6 for beer, $8 for wine, includes gratuity). At the third drink stop, you may independently purchase a beer, wine, or cocktail of your choice. Two small snacks are included. Occasionally, vegetarian options will be available, otherwise, any other dietary restrictions will not be accommodated. If you are gluten-free, dairy-free, or have other allergies, we cannot make substitutions.